What’s the difference between puppy love and dogged devotion? Not too much, if you’re a dog lover like me! When I received my copy of STEPDOG (William Morrow) by Nicole Galland I knew I was going to love this book! Look at the cover! Could that darling puppy holding his leash asking to be taken out for a walk be any cuter? I don’t think so. So, here’s the scoop. 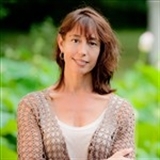 Sara Renault fires Rory O’Connor from his part-time job at a Boston art museum, and in response, Rory, an Irishman, actor, musician, former party-boy leans over and kisses her. Then she kisses him back. Now they’re a couple. Rory’s visa is about to run out on the cusp of his big Hollywood break, so Sara insists he marry her to get his green card. Well, in just a couple of weeks, they’ve gone from being friendly co-workers to a live-in couple, and it seems to be working out except for Cody, Sara’s beloved dog from her troubled previous relationship. What Rory perceives as Sara’s over-attachment to her dog, is the only thing they fight about. When Rory scores both his green card and the lead role in a TV pilot, he, Sara and Cody get ready to move to Los Angeles. But just before moving day, Cody is dognapped, and it’s Rory’s fault. Sara is beyond upset at losing her precious Cody, and angry at Rory for his stupidity. Desperate to get back into Sara’s good graces, Rory tracks Cody and the maniac dognapper to North Carolina. Can Rory rescue Cody and convince Sara that they all belong together as a family? 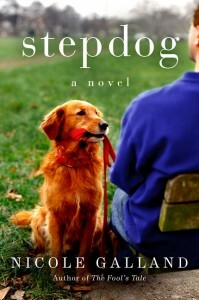 I really enjoyed STEPDOG, Nicole’s humor and whimsical writing style, but as a dog lover, I was curious by how Sara let Rory get away with bossing Cody around. Our dogs are our children and I wouldn’t let Rory raise his voice to Cody or tell him what to do. Some people might find my reaction harsh, but I found Rory’s tone quite telling about his erratic behavior later in the novel. Bottom line: We LOVE our four-legged children. Don’t mess with them. Thank you TLC Book Tours for including us on this book tour and for providing a copy of this novel for an honest review. Lucky us we have one copy to give away. Leave a comment telling us your favorite pet dog story and we’ll pick a winner Friday! Good luck. 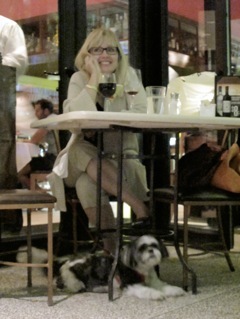 Every time we review a book about a dog, I like to show my shih Tzu, SASSY. Our dogs have become our children. They can add so much cheer to the home! Bogie, our 15 pound mix, similar to a collie is smart and sensitive so I call him The Philosopher since he can sense whom to trust, and whom to avoid. So far men in uniform, workmen scare him. When an old woman whom we knew died he was there and sensed that she had passed on and was very uneasy. He is a pleasure as a companion, loving and loyal. Gotta love Bogie … so loyal. Never question a dog’s reaction to a person. We had dogs while I was growing up, but when I got married we lived in an apartment that didn’t allow dogs. My daughter always wanted one. She worked for a dog walking/pet sitting company in high school. Now, in her 2nd year of college we adopted a multi-poo from a neighbor who didn’t have time for him. Diesel and Sara are inseparable now. That’s so wonderful. Dogs make a family. I still love when we went to pick out our new dog: We drive up to the place and told the boys they could pick out a dog! It was a total surprise as they thought we were going to look at Christmas lights. They did not believe us until we finally walked in! Best surprise ever! She will be 3 in October and the best dog ever!!! That’s beautiful. Merry fa la la la la! We don’t have any dogs, but we have 3 cats. My mother-in-law rescued a cat who was pregnant (she didn’t know this at the time). She had four kittens (2 males & 2 females). We took the 2 female kittens. That was almost 2 years ago and we love them to pieces. We recently adopted a female kitten from our local animal shelter. Our fur babies are named Justice, Liberty, and Freedom. If we ever move to a house with a backyard we want to add a Siberian Husky to our family too. Wow Claudia! You have a full house already! I can only imagine how much energy a husky will add to the family! I had a husky rescue who one day brought home a chicken. Fearing the worst, I went over to her and found the chicken unharmed other than doggie drool, took it back home and flung it over it’s owner’s fence. Fast forward to Thanksgiving: same dog brought home a turkey, fully cooked and wrapped up in foil etc. that somebody had placed on his/her porch to freeze…winter in AK, you know….porches are ancillary freezers 😉 Couldn’t return that since I had no idea from whose porch it came. My favorite story (or really, it’s the memory of it) was when I was 12, on Valentine’s Day, my dad brought home a beautiful Irish Setter/Golden Retriever mix red puppy. This was our first family dog that was “mine” because I was old enough to take care of him. I was so excited, and he was so incredibly cute (and red, with curly fur on his precious ears) that I cried and cried and cried when I saw him. His name was Dandy, and he was a great friend and dog. I miss him! There’s nothing like the memory of your first dog/friend. Thank you for sharing Jennifer. I loved this cover and book description ! I am a huge dog lover , they are not just pets , but family . My fur-grand-dog is a beautiful golden retriever who at 10 is still like a puppy . My fur-baby is a big Geman Shepard that brings me so much joy and love . You captured the way so many of us feel, Liz. The dog trumps the new boyfriend any day!